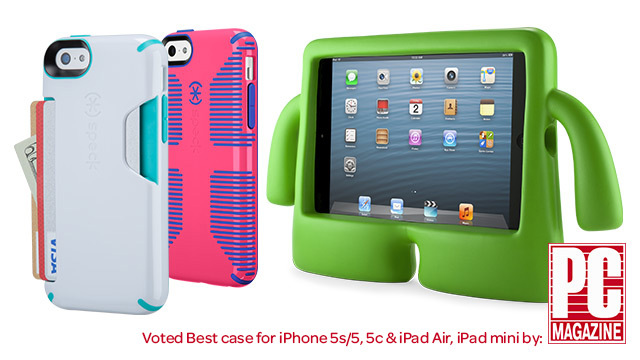 Looking for a case for your favorite mobile device? PC Mag will make your search oh-so-much easier. The site regularly publishes reviews and recommendations of the greatest cases available for whatever gadget you may carry- and needless to say, Speck’s made the list time and time again. The Best iPhone 5c Cases: Two of our cases topped this list; CandyShell Card for those who like to pack a lighter load, and CandyShell Grip featuring added grips for the perfect hold. The Best iPad Air Cases: Our StyleFolio for iPad Air made the cut with dozens of colors and patterns to choose from on a premium vegan leather cover for a suave and sophisticated look. The Best iPhone 5s/5 Cases: PC Mag gave more props to our CandyShell Grip for iPhone 5s/5 for an added “fun pattern to the case, and also makes your phone easier to grab.” We definitely agree. The Best iPad mini Cases: And yet another shoutout to the stylistic raised rubber ridges of CandyShell Grip for iPad mini, an oldie but goodie, which also packs your tablet with unmatched military-grade protection.